First of all, it is very important to note that the emergence of the “TOP 8” tournament as the top division of the new global PAL rating was the answer to the question that most armwrestling fans were worried about. This question was: is there life after the “Zloty Tur” World Cup? For many years, the Professional World Cup was the highest point in the career of a professional armwrestler and many felt that there was some kind of incompleteness in this. Armwrestling went ahead, the number of stars grew, but, unfortunately, only one athlete in the category could become the winner of this the most prestigious tournament. The PAL Vendetta discharged the situation a bit, and in recent years, 6 round fights have been held within the framework of the “Zloty Tur” and due to the outflow of the “old” elite, a place has been freed for new talents. However, the need for a top division was still there, as the status of the Vendetta participants in relation to the “Zloty Tur” participants was unclear. So, the first “TOP 8” tournament will be held in 2019. 8 strongest arm wrestlers of the world will take part in it and three more additional participants will make a reserve of the first season in case of unforeseen situations. 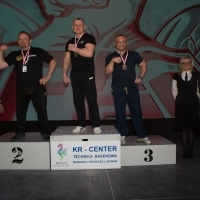 The tournament “TOP 8” is a series of 6 round fights, consisting of 3 stages, according to the results of which its participants will distribute 1-8 places of the highest division of the Unified Rating of Professional Armwrestling among themselves. In fact, there will be no losers in the tournament, since all eight places are prize ones. Before the start of the tournament, participants will be divided into Champions and Contenders. Then there will be a draw, organized in such a way that each Champion will be guaranteed to fight the Contender in the first stage of the tournament. At the first stage, 4 matches of the main team will be held, according to the results of which the participants will be divided into two groups - A (winners) and B (losers). Group A will continue to fight in the second stage for 1-4 places, and group B - for 5-8 places. At the second stage, a draw is held within each group and pairs are determined for further struggle. After the fights of the second stage, in the final third stage, the winners of Group A will compete for 1-2 places, the losers of Group A will pull for 3-4 places. The winners of Group B will compete for 5-6 place, the losers of Group B - for 7-8 places. According to the results of the final stage, the main prize pool of 121,000 US dollars will be distributed. 1st place - 50,000 US dollars. 2nd place - $ 20,000. 3rd place - 15,000 US dollars. 4th place - 10,000 US dollars. 5th place - 8,000 US dollars. 6th place - 7,000 US dollars. 7th place - 6,000 US dollars. 8th place - 5,000 US dollars. Oleg Zhokh regained consciousness and is already communicating with family. The “TOP 8” tournament will be held in 2019!